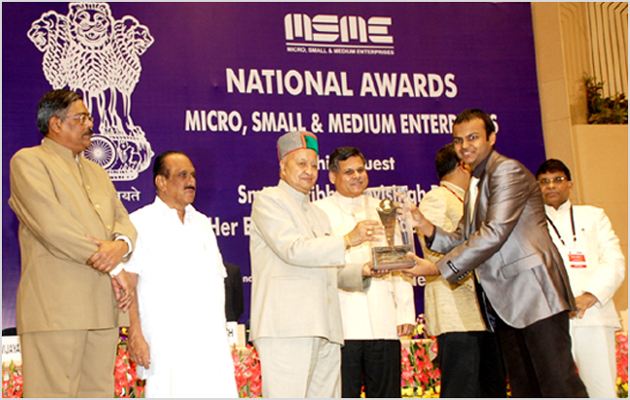 Cyfuture was presented with the prestigious "Micro, Small & Medium Enterprises National Award 2010" by Mr Virbhadra Singh, Minister of Micro, Small and Medium Enterprises in the presence of honorable president of India Smt Pratibha Devisingh Patil at a glittering ceremony in New Delhi. Micro, Small & Medium Enterprises National award is presented annually by the Ministry of Micro, Small & Medium Enterprises (MME) to those enterprises which excel in the various categories of entrepreneurship and business development. Ministry of MME was formed by merging Ministry of Agro and Rural Industries and Ministry of Small Scale Industries in the year 2007 to encourage and promote entrepreneurship and industrial development in different categories of economic spectrum. Commercial studies have shown that micro, small and medium enterprises are a major driving force to boost employment opportunities and propel regional economic growth. Cyfuture has shown sustained strong growth rate and consistent quality of service over a period of time, promoting regional economy and providing employment opportunities to everyone. Government of India has thus recognized and applauded the efforts of Cyfuture and presented the award to encourage further development in the sector. Being a recipient of such prestigious award, Cyfuture is now counted among those elite enterprises which believe in the power of research and quality in their products and service.